Neobitti Review 2019: Is Neobitti a Good Hosting? Neobitti is a WordPress managed hosting provider based in Finland. They offer a small selection of products primarily geared towards beginners or new website owners. Neobitti has been offering website hosting services since 2003. They are now one of the leading providers in Finland, with 100% customer satisfaction and their own servers based in Finland. Their main website is available in English, Finnish, Swedish, and Russian (via a Google Translate button at the top of the page) whilst their knowledge base is in only in Finnish. 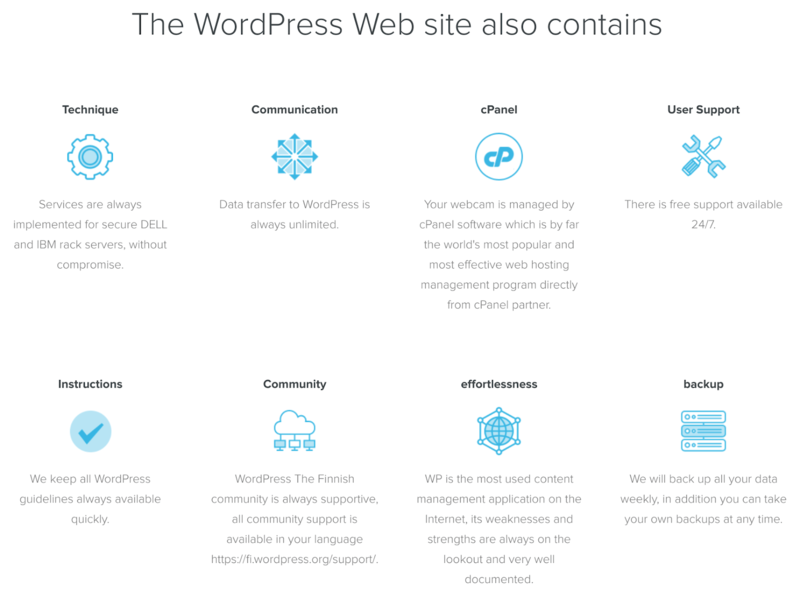 They provide fully managed WordPress hosting, meaning their servers are optimized for WordPress and they’ll pre-install WordPress with all hosting plans. At an added monthly cost, you can purchase their website building tool, which comes out of the box with sixty ready-made templates, color schemes and search engine-friendly tools. They have three managed WordPress packages, imaginatively called WordPress 1, 2 and 3. The disk space increases from 2GB to 5GB to 12GB respectively, whilst all other features remain the same. The most notable feature of Neobitti is the unlimited capacity of their packages. As well as the disk-based resource quotas, all plans come with unlimited traffic, databases, email accounts, domain names, and subdomains. This is really comprehensive, but be cautious that ‘unlimited’ can never mean truly unlimited. They don’t advertise their uptime, however, they do own and operate their own robust Dell and IBM servers, which are located in Finland. They use the cPanel control panel, which is great for reliability and compatibility, and all plans come with the Softaculous one-click installer, although it’s not clear how many programs are supported. The prices are high compared to regular shared hosting, but they are in line with other providers of WordPress managed hosting. You can purchase plans in one month or one-year terms. There is a very small discount if you purchase a one-year term, but not enough to incentivize me to purchase the longer plan. Domain registration, SSL certificates, and VAT (if applicable) are added on top of the package price. Sales support is via FAQs, email, and live chat from 10 am to 3 pm. Technical support is by ticket, email (24/7), telephone (9.30 am to noon) or text (24/7). Their knowledge center is pretty substantial, however, whilst they advertise live chat, I found that this leads the customer through to an online contact form, which isn’t my expectation of live chat. Neobitti is a Finnish host specializing in WordPress hosting with their own website building tool. In 2003, when they began, they were the first Finnish cPanel partner, and are now one of the leading providers in Finland. Check out Neobitti’s web hosting options today! Wondering how Neobitti stacks up against other Web Hosting companies? Enter any other Web Hosting company and we will give you a side-by-side comparison.